Family-friendly doesn’t have to be all about the kids. One destination that understands that well is the Shenandoah Valley’s Massanutten Resort.They’ve made it easy for Mom and Dad to have some adult time with adult-themed Specialty Dinners scheduled throughout the week. Drop the kids off at any number of nightly activities designed just for them and enjoy a Murder Mystery Dinner, Beer Lover’s Dinner, or the Winemaker’s Dinner which has been offered every Thursday for the past 10 years and featured in Southern Living. I had heard of wine-tasting dinners, but never a beer-tasting dinner. My taste buds were intrigued. Five courses paired with five complimentary craft beers – oh my! We were pleasantly surprised to be seated with our co-hosts for the evening, resident beer expert, Paul, and resort Entertainment Director, John, along his wife and a friend. If you like meeting new people and gabbing over dinner and drink as we do, the Massanutten’s Specialty Dinners are made for you. Paul started the dinner with a brief history of craft brewing, the kinds of brew we’d be trying and how to properly drink a beer. Yes, there is a correct way and it doesn’t involve a bong. You can distinguish the different tasting notes of the brew just as you can with wine, if you take the time to breathe in the aroma before drinking down half the glass. Be sure to sip the rest. As each course was served, Paul talked about how the paired beer was made, why he chose it for that dish and even how some of the brews came by their names. For instance, did you know a Porter is the combination of two different beers? Usually a brown and mild ale. The practice of mixing beers was popular among the English porters, and soon took their name. The room was filled with laughter in between courses as Paul enlightened us with knowledge and humor of his own special blend. And, the low hum of gastronomic delight during each course that Chef Michael Ritenour had created occupied the remaining time. Ours’ was an Oktoberfest-themed meal, beginning with fried Arancini with escargot and balsamic brown butter. I don’t know that I could’ve tried my first snail any other way. 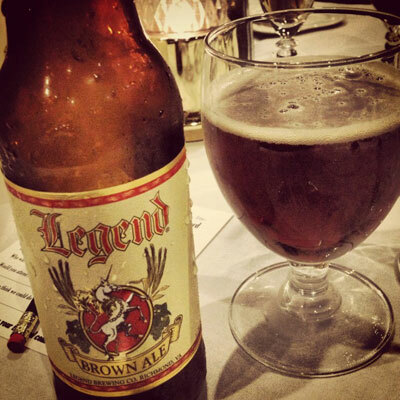 It went down easily with a Legend’s Brown Ale. The roasted garlic soup with Gorgonzola crouton served next, melted in my mouth and was a savory companion to a Spaten Oktoberfest beer. A quinoa and Bulgar wheat salad with dried cherries and pecans followed with my favorite discovery of the night: Dogfish Head Midas Touch. The entrée was everything it promised to be: amazing. How can you go wrong with a bone-in pork rack served with whipped sweet potatoes and spiced cider reduction? It was paired with Heavy Seas Loose Cannon. We finished every last bite along with every last drop. And now, the moment we had been waiting for… dessert! 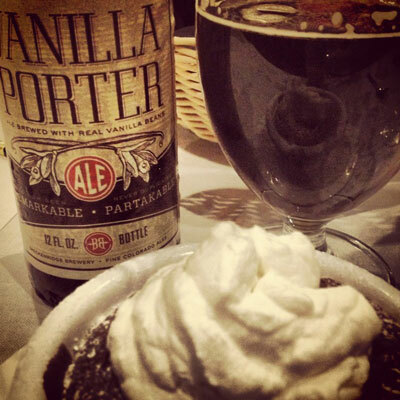 Chocolate lava cake with vanilla crème anglaise and a Breckenridge Vanilla Porter were a scrumptious pairing. As one of our favorite craft brewers here in Colorado, we couldn’t have asked for a more delicious ending to an even more delicious evening. Chef Ritenour crafts new menus every week. Be sure and take a peek and see why a stay plus dinner at Massanutten Resort is worth your while if you plan to visit Virginia. Disclosure: The Massanutten Resort hosted my family and I for the purposes of writing this review. No other compensation was provided. All opinions expressed are my own and without influence by Massanutten.